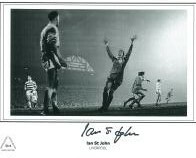 Ian St. John (born 7 June 1938 in Motherwell, Lanarkshire, Scotland) is a former Scottish footballer, who played for Scotland 21 times. He later became a manager and pundit. In 2008 he was inducted into the Scottish Football Hall of Fame.